The bones and cartilage in the neck and lower back slowly degenerate with age, resulting in the pain and stiffness of spondylosis. There are two kinds of spondylosis: if the symptoms are in the neck it’s called cervical spondylosis, and if they’re in the lower back, it’s lumbar spondylosis. As everyone over the age of 45 has some amount of cervical or lumbar spondylosis, it’s considered part of the normal ageing process. Spondylosis is osteoarthritis changing the spinal column where the vertebrae and the disks of cartilage between them start to degenerate. Where motion is best, that’s in the neck and the lower back, the bones become thickened, and bony spurs called osteophytes grow on the borders of the vertebrae. Osteophytes may press on spinal nerves, giving rise to root pain radiating down the arms and legs. numbness, tingling and muscle weakness in the hands, arms and legs. Occasionally, if the head is transferred too fast, the bony spurs may briefly compress blood vessels that supply the brain, causing dizziness, unsteadiness and double vision (drop attacks). As spondylosis may be symptomless, the illness is often just diagnosed when an X ray is taken for another reason. If you experience neck pain or dizziness, you should consult your physician, who may organize X rays to try to find indications of cervical spondylosis. If your physician doubts your symptoms are due only to cervical spondylosis, they may arrange for additional tests to try to find other causes, including a prolapsed or herniated (slipped) disk. You may also have nerve conduction studies and electromyography (EMG) to evaluate the function of nerves in your arms and hands. CT (computerized tomography) scan or MRI (magnetic resonance imaging) might also be carried out to see whether there have been any changes in the bones of the spine, the disks or cartilage between them, or the tissues around them. Degeneration of the back cannot be stopped, but its effects can be reduced with treatment. To alleviate pain in moderate cases of cervical spondylosis, your physician may recommend painkillers, like paracetamol, or prescribe non-steroidal anti-inflammatory drugs (NSAIDs). After the initial pain was alleviated, she or he may propose neck exercises to help maintain mobility and increase muscle strength in your neck. If cervical spondylosis has damaged a nerve, surgery may be recommended to prevent the symptoms from getting worse. This includes widening the natural opening between the vertebrae by which the nerve passes when it branches off the spinal cord. Sometimes, surgery might also be carried out to stabilize the back by fusing together the affected vertebrae. Sometimes spondylosis continues to become inflamed when the illness is called spondylitis. This may need treatment with anti-inflammatory drugs. One spinal bone may slip out of place forwards onto another bone, causing pain because the adjoining muscles and ligaments are kept under reach. 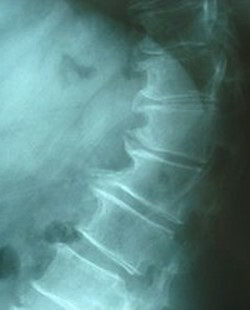 This appears in the lower lumbar area and may be symptomless.